I love the look and feel of the swarovski pearls. They are shiny and feel warm on the body. 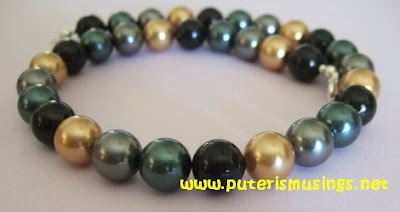 Last week I ordered some bright gold, mystic black, dark grey and tahitian colored swarovski pearls from my favorite online store. When the pearls arrived today, I just had to string them right away! These particular shades of pearls were inspired by Nancy Pelosi's (yes, our speaker of the House of Representatives) necklace that I saw her wear one day. I don't particularly like the size of the beads that she usually wears around her neck, but the colors of the beads can be quite interesting! I like the bright gold colored pearls and I can see them go very well with clear crystals. I can already imagine the finished product!